There is a really great article over at Hero Complex, where the LA Times reporter takes a look at DC’s Relaunch and the move to digital comics. One of the most important elements in the article is the mention that Justice League #1 has pre-orders over 200,000 copies. In the short run, it seems everyone in the comic-book industry will benefit. 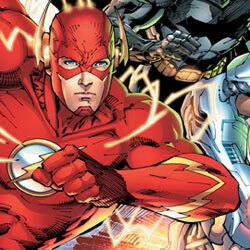 DC’s flagship title, “Justice League No. 1,” has pre-orders for more than 200,000 print copies, which would make it the bestselling title of 2011. Six other new DC No. 1’s already have more than 100,000 pre-orders. While pre-orders and final sales are quite different from one another, if these numbers do indeed turn out to be true, then DC may have indeed given a shot in the arm to the industry. While the number ones are a big deal, what will really be interesting is to see how well the number twos will sell as the August pre-orders were due to shops on Saturday. Grant Morrison was just talking in Rolling Stone about how no title broke 100,000 in May. i can’t listen to your podcasts at work, the IT guys block it. Also, this could simply mean that people who’re still involved in comic-book speculation have bet on yet another bunch of #1s to recoup their investments, and ordered 10/person. I’m glad you pointed out that “pre-orders” =/= sold merch. ^_^ As the people at HP are finding out due to the “tablet wars”, it doesn’t matter -whose- shelves (warehouses or stores) things are sitting on if people ain’t buying them.